Sterling silver bracelets for men and women display a cool-hued elegance. Styles range from simple to spectacular to complement all your looks. Find a bangle, charm bracelet, coil, cuff, link, station, toggle or gemstone strand. Take a look at John Hardy Classic Chain bracelets with your choice of amethyst, black, blue or red sapphire, green Tsavorite or pink spinel. Check out a Tacori sterling silver promise bracelet with a key. EK Designs produces bracelets with occasional themes; find a piece for a first-time mother, and religious motifs for bat mitzvahs and confirmations. Bracelets from Honora feature pearl and sterling designs with captivating colors. 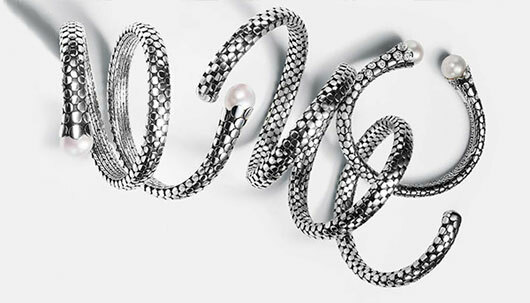 The Stephen Webster La Mer and Jewels Verne collections have an aquatic theme and feature designs reminiscent of a shark jaw and fish bone, respectively. Gucci charm bracelets jingle, jangle, and delight! And for the young (and young-at-heart), there are sterling and enamel bracelets. There are a host of wonderful ways to wrap your wrist. Find your signature style today!